The March 4 incident followed earlier fabricated accusations, falsely blaming Russia for things it had nothing to do with. No evidence was presented corroborating all accusations made. Anyone with minimum intelligence know claims without proof don’t pass the smell test. The likely US/UK-staged Skripal incident has the overwhelming aroma of Russophobic disinformation – demonizing a country opposing Washington’s imperial agenda, defeating its regime change aim in Syria, foiling its plan to redraw the Middle East map, its scheme for dominating the region together with Israel. The main US/Israeli objective is replacing Islamic Republic of Iran governance with pro-Western puppet rule. The road to Tehran runs through Damascus now blocked by Russia. Putin apparently intends staying the course, knowing if Syria and Iran fall, Russia and China are Washington’s next targets. These nations are the only ones standing in the way of unchallenged US global dominance – its longstanding imperial goal crucial to prevent. Along with continuing its anti-terrorism operations in Syria, Russia intends debunking the Skripal hoax. Do any exist? Allegedly poisoned police detective Nick Bailey is alive, discharged from hospitalization, and well. Skripal’s daughter Yulia appears heading for a full recovery from whatever may have harmed her – clearly not a military-grade nerve agent as falsely claimed, able to kill in minutes, survival not possible if affected. 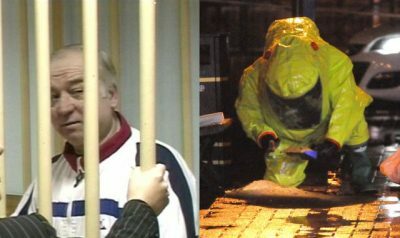 Is Sergey Skripal’s “miraculous recovery” next? Britain continues suppressing information about the March 4 incident. London led a worldwide “campaign to create an absolute presumption of Russia’s guilt” despite no corroborating evidence proving it. Moscow considers the Skripal incident an “assassination attempt” of Russian citizens,” a scheme to falsely blame the Kremlin for what happened. UK Porton Down Defense Science and Technology Laboratory head Gary Aitkenhead “admitt(ed)” Britain was developing poisonous substances it falsely claimed Russia used. A previous article suggested the Organization for the Prohibition of Chemical Weapons (OPCW) is likely to rubber-stamp UK claims about the Skripal incident – given samples of alleged evidence were provided by Theresa May’s government. If Russian experts are barred from participation in the OPCW probe, its findings will be rejected, Shulgin stressed. OPCW director general Ahmet Uzumcu refused to share information about the investigation it’s conducting without UK approval – a policy Moscow rejects, calling its probe invalid. An official objection was submitted to the organization stressing this position. On Monday, Sergey Lavrov slammed Britain for “tak(ing) their game too far.” Separately, Russian Foreign Ministry spokeswoman Maria Zakharova called what’s going on “a major failure for Theresa May…exposing a large-scale effort to manipulate international public opinion” – through fabricated accusations clear to everyone paying attention. East/West tensions are at a dangerous fever pitch – risking serious consequences if things continue on their present course.